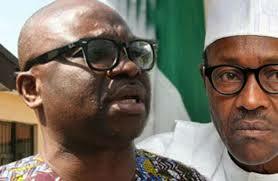 The Ekiti State Governor, Mr. Ayodele Fayose, has urged President Muhammadu Buhari to stop shielding his men from probe, just as he asked Nigerians to demand the release of the authentic report of the Committee on Audit of Defence Equipment Procurement in the Nigerian Armed Forces. He described the claim by the federal government that the probe panel only looked into procurement and contracts awarded by the military between 2011-2015 because documents regarding procurement from 2007 to 2010 were not available as a clear indication of his support for corruption. The governor said it smacks of sheer hypocrisy and nepotism for anyone to accept that fraud could have been perpetrated on procurement and award of contracts in an establishment without the involvement of the director of procurement. He said: “Buhari’s’ Minister of Interior, General Abdulrahman Dambazau (rtd), was Chief of Army Staff between 2008 and 2010 and the current Chief Of Army Staff, Major General Tukur Buratai served as Director of Procurements, Defence Headquarters, from 2012 till May 2015. “Questions Nigerians must now begin to ask President Buhari and his government are: Where is the report of Presidential Committee on Audit of Defence Equipment Procurement relating to 2007 to 2010? Who doctored the committee report and why? “Early this year, we were told that an ally of President Buhari and chieftain of the APC, Brig. General Jafaru Isa (rtd), refunded N100 million of the N170 million he allegedly received from a former National Security Adviser (NSA), Col. Sambo Dasuki (rtd). “It took the Ministry of Defence and ths Code of Conduct Bureau only one week to clear Buratai but others from the opposition party would be languishing in prison while EFCC go about fishing for evidence against them. “Like I and other well-meaning Nigerians have maintained, fighting corruption is a good idea but the moment documents of probe panels are being doctored to shield those seen as the President’s men, the entire purpose of the corruption fight has been defeated.